Nearly every month we host Spaghetti Saturday. When the weather warms up .. spaghetti and meatballs can seem a bit too heavy. So we debate .. should we switch it up? Maybe BLTs? Grilled pizza? Or even something a little bit fancy? A true summer celebration? It's a sunny June day. I preheat the oven and start to prep the meatballs. The water-walking ladies fill me in on the highlights from their week. Lunches with friends .. what they made for dinner .. summer trips being planned. The afternoon fades .. everyone will be here soon. My husband switches the station to jazz .. I reach for lip gloss and pour a Prosecco. As I wipe the countertops and ready a cheese plate .. I glance out the window and see her sitting in and amongst her pretty daisies reading a book. How long has it been since I've had a daisy patch of my own? unless .. of course ..
At seven sharp .. guests begin to arrive with cheeks flushed from the heat. The unmade cheese plate is finished and graze on appetizers as everybody catches up. Dinner is served and gone before we know it. Conversations are interesting and fun .. dotted with frequent interruptions from puppies. I help but wonder if that question isn't the answer. To see .. to pay attention. To watch as time marches on .. with or without our involvement .. with our without our permission. To notice when the plants need water .. to remember the pool is open for only a short season. The salad chapters in the church cookbooks on my desk are my some of my favorites. They’re where you’d expect a salad chapter to be .. right after the appetizers and before the mains .. although oddly enough ingredients like mini marshmallows, cool whip, and cream cheese make regular appearances. The good news? 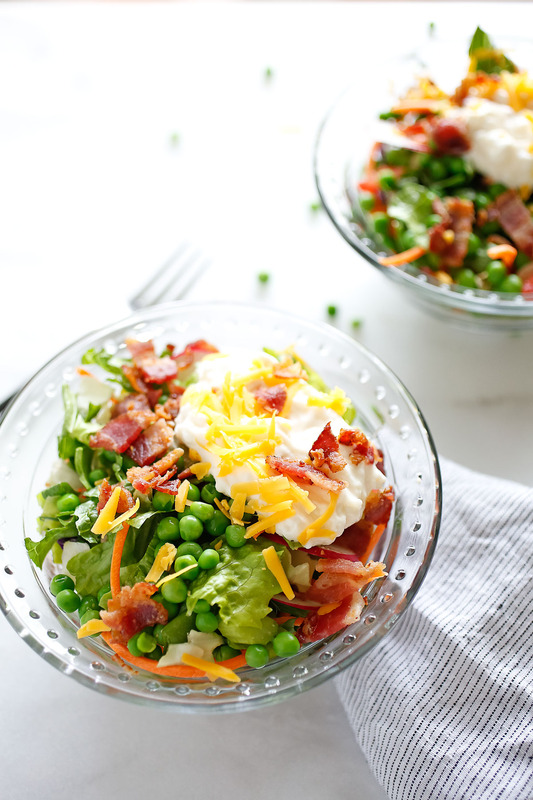 The classic Seven Layer salad is tucked in and amongst and is truly a sight to behold. In a large salad bowl, add the greens. Spread mayonnaise over peas, covering top completely and sealing to edge of the bowl. I’ve always made my salads pretty regular and boring if I’m honest. This has really inspired me to be more creative. 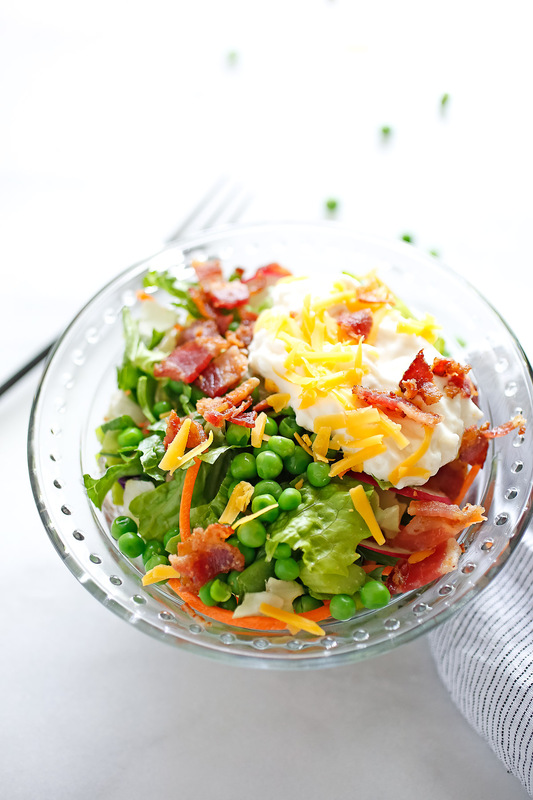 I love crispy bacon but had never thought of adding it to my salad. That Seven Layer Salad looks yummy.! I’m not surprised that it disappears once served. Haha…too funny about midwestern “salads” containing marshmallows, cool whip or jello. That kind of reminds me of some salads that my relatives and neighbours made in the 70s!! I don’t know why I hadn’t thought to put fresh peas in salad. It looks really good, and it is nice to serve fresh, healthy options. You are right about entertaining too, it can be so stressful, and it shouldn’t overwhelm the mood of the party. This looks yummy and I love the colors. Such a great idea to layers the different items because it makes such a great visual. That looks fabulous! I love the burst of colour and all of the ingredients! Normally I see refried beans in a 7 layer and those make me gag! This is one I’d definitely eat! As a parent of two boys I frequently wonder where the time went, and tell new mothers not to blink. The salad looks great, I love all of the color. I love a good seven layer salad and this one looks delicious!! I need to make this soon!! That Seven Layer Salad looks very delicious. I haven’t eaten any veggie salad for a long time. Maybe when my mom comes back home, I would ask her to do one. The foods looks yummy. Maybe then I will try doing this with my friends. I love having people over, good food, people and great wine are all you need, plus you get to share this fab layered salad with them also. Sounds like the perfect recipe for the perfect get together. Now that is what I call a huge salad and a filler of a meal as well. It is most definitely one amazing salad, it could really make for a huge part of a meal. I constantly lose things, all day, every day. I don’t know how I get anything done. My son keeps asking me to make more salads. I love eating them, but man do I hate making them. I love the idea of layering the ingredients. I was tasked with bringing a salad to a cookout I was invited to later this week. I am sure this 7 layer salad will be a hit. This looks like a hearty salad that will fill up your tummy without a lot of effort to put it together. I hadn’t thought of using mayo for a topping on salads but that does seem like it would go well with this. Of course you had me at BACON! Nice recipe! This is a delicious recipe that I made all the time way back in the day. I haven’t had it in years and now I’m wanting to make it again. Whenever I’m hosting a dinner party, I try to create a fun, relaxing atomosphere. I almost never host and would be a nervous wreck if I had to host a dinner. This salad looks amazing! Now this sounds like the perfect salad, loving all the ingredients. I find that I’m always asking where the time has gone these days. My youngest son will be 18 and leaving school in four years time, and I’m starting to get nervous about having an empty nest after all this time. Gorgeous salad, by the way, I always think they look stunning layered up in a glass bowl. 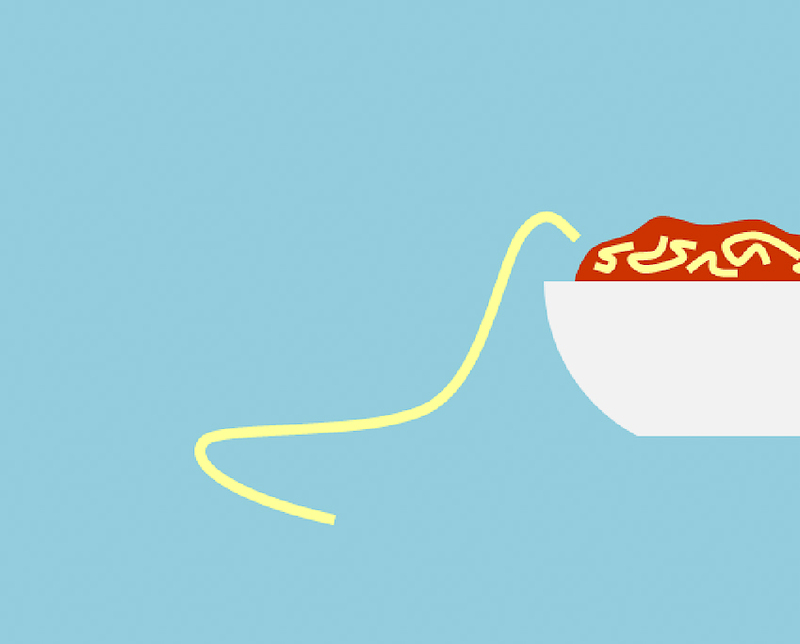 We make a lot of spaghetti because it’s one of the kid’s favorites. I’ve never thought to make a layered salad with it. I’ll have to change that because it looks divine. Hosting a dinner party for 20 people sounds crazy stressful! We’ve thrown family parties for at least that many people, but usually it’s more of a pot luck/serve yourself deal. You’re very brave! 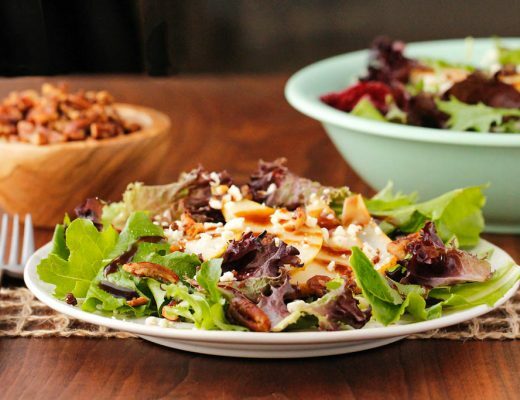 That salad is so beautiful, the perfect centerpiece and start to a dinner! I love the idea of Spaghetti Saturday, and the idea of ignoring the chores for a while to bake cookies as a nice gift for someone. I think I have seen some of the same hosts that Nora Ephron has. Scary, wild eyed people running around wanting to make me run out of the building screaming, or pinching myself to see if I am in a nightmare. As for the rest of the post, I really do love your view of time here and the sudden realization of how quickly things move. I think it’s really hard to stay present sometimes. And I think the world encourages us not to be present in our lives far too often, distracting us with every shiny toy that there is. I do think that dinners like your Spaghetti Saturday with friends do help us to slow down. And they do allow us to appreciate the things in our lives, even if they go by more quickly than I would like. As for the salad, it looks absolutely delicious. It looks like a perfect summer compliment to a meal. Right now it’s so hot and cooking anything doesn’t feel very appealing but this looks wonderful. May I am not reading this right or something. But I am going to say this” Time fly by so fast and before you know it is gone. Enjoy every moment of every day no matter is it is good or bad. ” Thanks for sharing your thoughts and the ideas. That Seven Layer Salad looks yummy.! loving all the ingredients. Maybe then I will try doing this with my friends. My mom’s like that, asking where did _ go. Usually it’s her eyeglasses she’s looking for and some groceries she has just bought in the same day. We don’t usually have salads at home but when we do, we like it without a heavy layer of mayo. We prefer plain and simple greens and just light dressing to go with it. Adding bacon will be nice, too. I love this blog post. 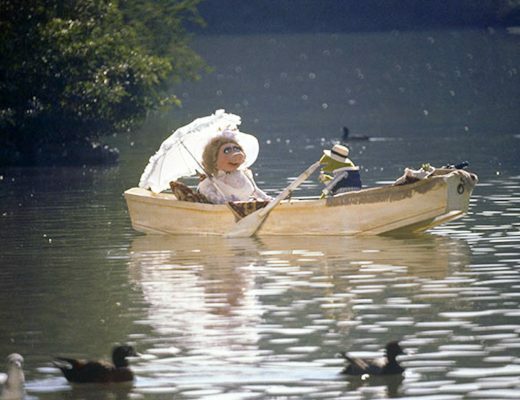 I love summer, and enjoy company during summer nights. Times sure goes by too fast. I’ll have to try a seven layer salad sometime. I think I’d used avocados in ours. They are delicious with lettuce while ripe. That seven layer salad looks delicious. I am a sucker for anything with bacon! I’m all about summer salads, too. I am not sure I have ever had a seven layer dip or salad. Maybe it isn’t a thing in Canada? Regardless, I am all over any food with bacon in it. Yumma! I love your writing style! I always feel like I am getting a story or inspiration with my recipe of the day! Absolutely love the idea! I love salad, always make my own salad every day, can’t get enough of it! There’s never enough time and then when we realize that time has passed we wonder where the time went. It doesn’t feel like my boys are the age they are, it doesn’t feel like that much time has passed. Ha, I love hosting but do tend to get quite stressed even though my husband does the cooking!!! That looks so good! And salads are just so easy and refreshing in the summer – Perfect if you don’t have time to go around and do anything more elaborate. The best salad for me is always one with variety. Different textures – crunches, pop, snaps, crisp. This salad seems to have all of that plus be delicious to boot! Thanks so much for sharing – I need to try this one out soon! This looks like such an amazing salad! 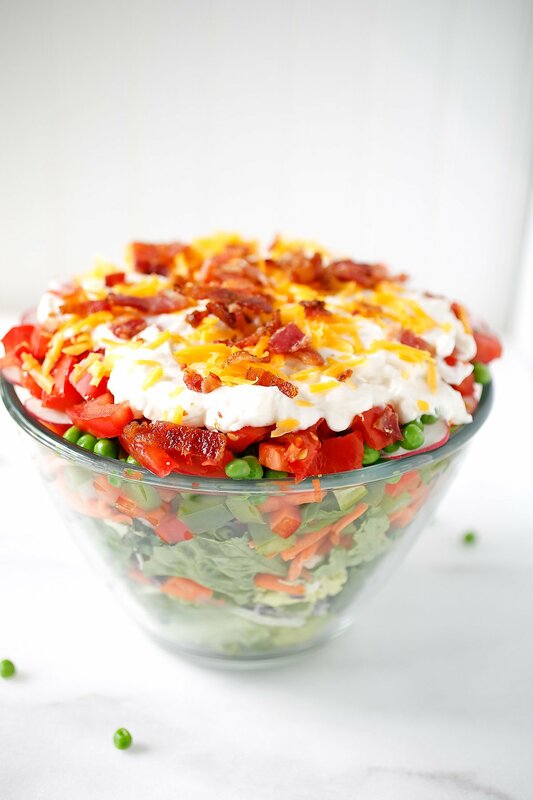 I love seven layer dip but a seven layer salad sounds even better! I definitely will have to make this for the next picnic or potluck I go to, it would be such a huge hit! Time! I always seem to be in a rush with not enough time in the day to do everything that I need to do. But I am trying to practice mindfulness and really be in the moment. That salad looks pretty nice too! This salad looks divine. I’m always on the hunt for a good dish to take to my chica brunches once a month. I may have to add this to my next event. Looks easy and very colorful. Thanks for sharing. You are very brave to have managed to host a dinner party for 20 people! Wow, I could not even imagine how stressful it must have been, even if the food was quite simple (but delicious). It’s nice to hear you’ve made your own meatballs 🙂 I remember when I hosted an Easter dinner for about 5 friends and I decided to cook the traditional Romanian sweet…. that was stressful! And it costed me about 10 times as much than buying it from the store and about 3 hours to make. But hey, I’ve made it with my own hands! Time is such a cruel yet uncontrollable aspect of life. Yes, let the cheese plate go unfinished because nobody will care or notice anyways. For me, a salad has to be good in order for me to really get into it. I don’t like salad but if it’s got all the great trimmings like this, I would definitely go for it. 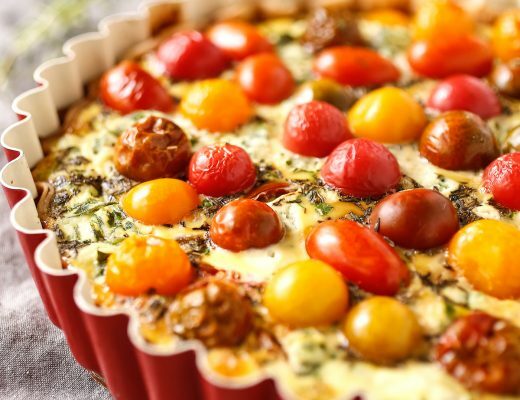 Summer can certainly be tricky when it comes to healthy food because it’s so hot. Time does seem to fly past fast when you are preparing a meal and have guests coming over. I’m normally quite relaxed as I try to get as much prep done before they get to mine and hubby keeps the kids out of the way. 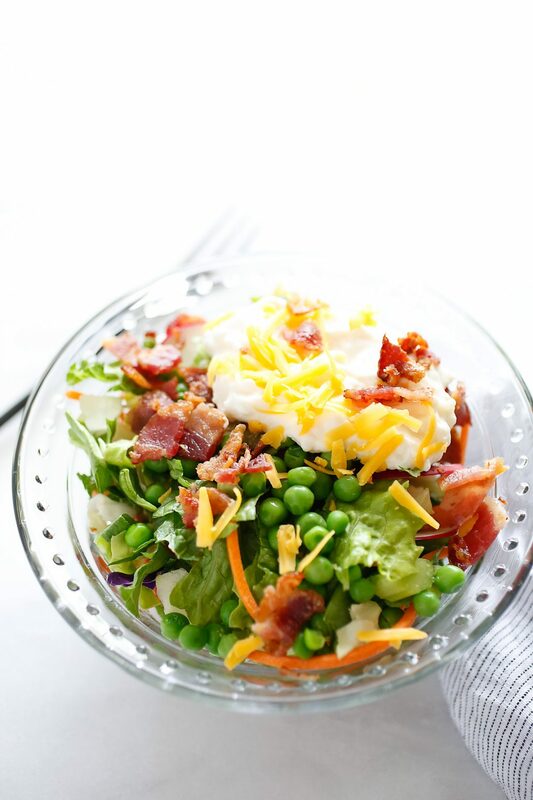 Bacon really does work well in salads. We make a similar salad for some of our family birthday celebrations. So easy to make and they always make the table setting look great too. Almost too pretty to eat….almost. 😉 Thanks for your great recipe. Will need to try it soon. Oh my gosh, that would be my kind of feast. I so love this, I think my daughter would give me a million kisses if I prepare this one day. Spaghetti Saturday sounds awesome. I am a nervous hostess as everyone arrives, but soon after, I feel much more relaxed and confident. I do love a good layered salad. This one would definitely be perfect for a get together. I don’t think that this would last long in our house either. Anything with bacon on the top is good with me. Absolutely agree about paying attention. Life is about the journey, not the destination. Lovely sentiment accompanying a delicious looking recipe. I’ve never hosted a dinner party myself but a friend of mine does and she always puts on a great dinner with great entertainment. Whenever I’m back in England it’s one of the things I look forward to. She is also a nervous hostess, I and other friends always tell her to relax because she always does a great job but I guess that’s easily said than done. I suppose being just a guest you never see just how much work and prep goes into the day. I enjoy layered salads as they give great texture to them and you can alternate the ingredients with different colours to make hem colourful. I’m still newly venturing out into the ‘salad-world’ and have tried to find different combos that work for me. I like the sound of this recipe. I may need to try it out. Well I am a firm believer that time flies! Especially if you are cooking for 20+ (!!!!!) And I am that kind of hostess, you should’ve seen me a few days back in my daughters first year party, which was held in the park!!!! Crazy! I love tht there are so many different things thrown into this salad as I’m always at a loss as to how to make a salad at home more interesting. I have most of these ingredients around at home so I must give this a try on a hot day! Salad galore, i love this seven layer salad. My friends will love it too and paired with wine . Hosting a party for my guest always makes me nervous everytime. I have a big party next weekend and I’m preparing a seven -layer salad too, it’s always a hit with my guest. With many of them vegans, this salad will definitely be a great addition to my menu. I’ve actually never tried my hands on a 7-layered salad, but this one looks superb! I’ve been on a diet lately and I want to take more greens but most of the time, salads are a bit boring. But this? This is a salad I can have! Thanks for sharing! We make a similar salad for big family gatherings. It is a great salad to feed a crew and super easy to make. There is something great about finding time to enjoy family over great food. I love hosting too! One thing I enjoy but never get the chance to do is have friends over. Living in a one bedroom apartment doesnt permit. Cant wait to have a bigger place so I can host. Love it!